One month ago Chris and I officially became parents. Roman Raphael LoSacco was born at home on January 26 at 5:57pm. 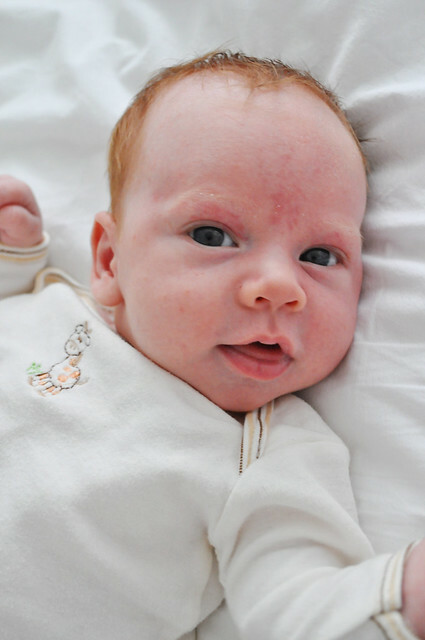 He weighed in at 7lbs 6oz, measured 22 inches long, and arrived with a head full of surprising strawberry blonde hair. His first name is a nod to his place of conception (something I’m sure he’ll love hearing as he gets older)–though, truth be told, it was also the one name that Chris and I agreed on. His middle name was given in honor of Chris’ grandmother, Raffaela, who passed away last summer. Giving birth at home was an incredible experience; even the prenatal care that we received in planning for a homebirth was so special and amazing. Chris and I couldn’t be happier with our decision and can’t imagine having done things any differently. I’m still gathering my thoughts and working on writing it out, but I will definitely share the story of our little man’s birth in a future post. At one month old, Roman has finally become more “tiny person” than “sleepy ball of goo”. He focuses on things now and has started reaching and grasping. So far my hair seems to be his preferred thing to grab (there may be a mom coif in my future). Toys have become interesting to him. He bats at the small stuffed animals that hang above his bouncer and will briefly chew and hold onto his Sophie. He’s a strong little guy and has been able to hold his head up for a few seconds at a time since birth; he can now do so for a couple minutes. And if he can get traction on his feet, he’ll push himself forward on his belly with his powerful little legs (the same ones that beat up my ribs so badly that I still feel bruised!). We’re all pretty much expecting him to get up and walk away any minute. And maybe my favorite thing thing of all: he just started smiling for real. Every time it happens, I’m not sure whether to laugh or cry. Becoming a mother has been wonderful and mind-boggling, but has also felt like the most normal, natural thing in the world. It’s hard to wrap my head around the fact that Chris and I created this complete, tiny human being and that he grew inside my body. I look at him and think nearly every day, Wow, I can’t believe he’s ours. The enormity of the love I feel for him is humbling. Yet in the midst of all the awe I feel at the mere fact of his existence, caring for this beautiful baby boy feels almost ordinary and precisely like what I’m supposed to be doing right now. Everyone tells you that having a baby changes your life in ways that you could never imagine or prepare for. Maybe it’s the mentality that we went into this whole thing with, or maybe it’s the peaceful, non-dramatic way that Roman came into the world, but Chris and I both agree that our lives feel quite unshaken. We’re still doing our thing (naturally, many of the details have changed), it’s just that now we have this amazing little guy to share it all with. I can honestly say that I have never felt more thankful for anything, and my life has never felt more full and complete. I am so very happy that he’s here. He’s beautiful, and it’s a beautiful post as well. Thanks for sharing, and congrats again!! Congratulations! It sounds like so much has changed with this new addition (for the better, of course). SO beautiful Britt. Incredibly happy for you. Congrats!!! He’s SO HANDSOME! !